This Wednesday, the Royal Malaysian Police (PDRM) launched the nationwide deployment of the Self-Monitoring Analytics Reporting Technology (SMART) Lock-Up Management System. 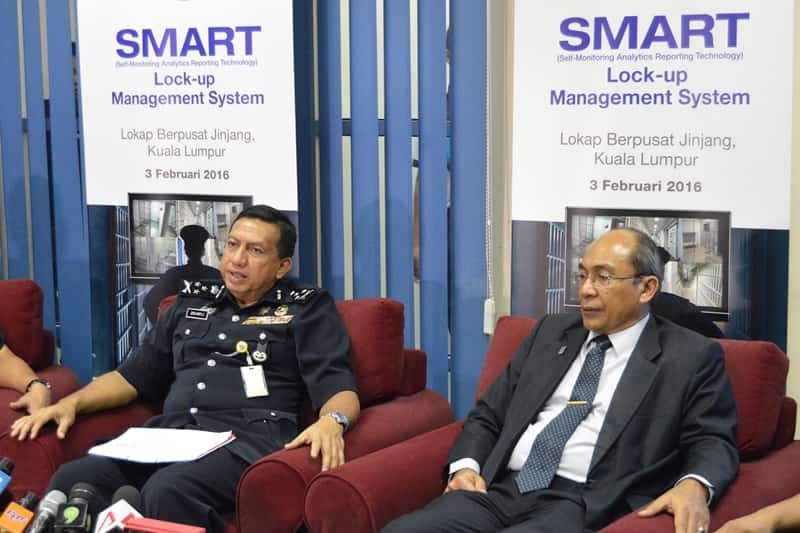 SMART Lock-Up just completed a successful 15-month pilot run in 27 cells at the PDRM’s Centralised Lock-Up facilities in Jinjang, preparing it for nationwide placement. The SMART Lock-Up system has transformed the management of the lock-up facilities, using advanced video analytics, 3D location indicators, and the business intelligence analyser. OpenGov was invited to the briefing session, located at PDRM’s Centralised Lock-Up facilities in Jinjang, which introduced us to the capabilities and benefits of SMART Lock-Up. MIMOS has been working with PDRM and national law enforcement agencies to develop modern policing technologies. Their efforts towards creating this advanced, technology-based system, will effectively transform prisons across the country. This work falls in line with the Reducing Crime National Key Results Area (NKRA). SMART Lock-Up is the first of its kind in the Asia Pacific to integrate video analytics, IoT, data security, and a high grade reporting dashboard, all within the Prison’s ICT infrastructure. “The new system represents a thoughtful and innovative approach in detainee monitoring. With the system, the security and safety level at the police lock-up, as well as the overall management, can be greatly enhanced. With the intelligent surveillance; the health and safety of detainees during remand can be efficiently monitored. Incidents such as breaks, violent fights, suicides and custodial deaths can be more effectively monitored and prevented,” said PDRM’s Director of Management, Commissioner of Police, Dato’ Pahlawan Zulkifli Abdullah, during the briefing session. Working together, these technologies provide an integrated lock-up management platform which is intelligent and more accessible for lock-up officers to use. MIMOS was proud to boast that the SMART Lock-Up system was developed using multiple technology from local experts. More than 20 patents were filed through the Intellectual Property Corporation of Malaysia (MyIPO). The main outcome of SMART Lock-Up is improved safety and overall site management of the lock-up facilities. Officers are able to better manage detainee misconduct or suspicious behavior with machine assisted monitoring, based on input from video analytics and the 3D location indicator. As the cameras pick up the video images, they are fed through the analytics system to detect behaviors such as fighting, loitering, climbing, vandalism and suicidal actions by detainees. The 3D location indicator helps in observing, tracking, and monitoring the activities of inmates – decreasing the need for officers to make frequent rounds. “The SMART Lock-Up system is intelligent and we wanted the monitoring process to be as simple as possible. This allows the workers to be more productive and have less manual work,” MIMOS President and CEO, Datuk Abdul Wahab Abdullah, stated during the briefing session. Although it may seem that such a system would intruding on inmates’ privacy, PDRM worked with the Human Rights Commission of Malaysia (SUHAKAM) to ensure this new system did not violate any human rights. To meet these standards, SMART Lock-Up has designated areas where the video captured is blacked out, such as the restroom stalls. Where will SMART Lock-Up be next? With a total expenditure of 1 Million Malaysia Ringgit (USD$235 Thousand), SMART Lock-Up is an investment towards Malaysia’s future of public safety and modern policing. Thillai Raj T Ramanathan, Chief Technology Officer, MIMOS, had stated that the system could also be deployed at other institutions such as immigration detention depots, juvenile facilities, rehabilitation centres, correctional facilities and other detention centres. SMART Lock-Up has just completed its 15-month trial at Jinjang and the PDRM is looking to subsequently roll-out the system, nationwide. Phase 2 of the SMART Lock-Up Management System will look to improve upon the existing infrastructure, adding tablets, and mobile devices. By the end of the year, , they are looking to implement SMART Lock-Up in all 48 cells throughout PDRM’s Centralised Lock-Up facilities in Jinjang.